The world was stunned when Russia invaded Crimea, but should it have been? Author and journalist Oliver Bullough says President Vladimir Putin never kept secret his intention to restore Russian power - what's less clear, he says, is how long the country's rise can continue. On 16 August 1999, the members of Russia's parliament - the State Duma - met to approve the candidacy of a prime minister. They heard the candidate's speech, they asked him a few questions, and they dutifully confirmed him in the position. This was President Boris Yeltsin's fifth premier in 16 months, and one confused party leader got the name wrong. He said he would support the candidacy of Stepashin - the surname of the recently sacked prime minister - rather than that of his little-known successor, before making an embarrassing correction. If even leading Duma deputies couldn't remember the new prime minister's name, you couldn't blame the rest of the world if it didn't pay much attention to his speech. He was unlikely to head the Russian government for more than a couple of months anyway, so why bother? That man was a former KGB officer, Vladimir Putin, and he has been in charge of the world's largest country, as president or prime minister, ever since. Few realised it at the time, because few were listening, but that speech provided a blueprint for pretty much everything he has done, for how he would re-shape a country that was perilously close to total collapse. Just 364 days previously, Russia had defaulted on its debt. Salaries for public sector workers and pensions were being paid months late, if at all. Basic infrastructure was collapsing. The country's most prized assets belonged to a handful of well-connected "oligarchs", who ran the country like a private fiefdom. The once-mighty Russian army had lost a war in Chechnya, a place with fewer inhabitants than Russia had soldiers. Three former Warsaw Pact allies had joined Nato, bringing the Western alliance up to Russia's borders. Meanwhile, the country was led by Yeltsin, an irascible drunkard in fragile health. The situation was desperate, but Putin had a plan. "I cannot cover all the tasks facing the government in this speech. But I do know one thing for sure: not one of those tasks can be performed without imposing basic order and discipline in this country, without strengthening the vertical chain," he told the assembled parliamentarians. Born in Leningrad in 1952, Putin came of age in the Soviet Union's golden years, the period after the USSR's astonishing triumph in World War Two. Sputnik, the hydrogen bomb, Laika the dog and Yuri Gagarin all bore witness to Soviet ingenuity. The crushing of Hungary in 1956 and Czechoslovakia in 1968 bore witness to Soviet resolve. Soviet citizens were enjoying a time of peace and prosperity. Life was stable. People got paid. The world respected them. Everyone knew their place. A most important instrument and a most important priority for the government is a secure food supply. We will provide serious assistance to the agrarian sector and in the final analysis to millions of peasants who have just one concern - to feed the country with quality Russian produce. Russia's territorial integrity is not subject to negotiation. Or, especially, to horse trading or blackmail. We will take tough action against anyone who infringes upon our territorial integrity, using all the legal means available to us. When Putin spoke to the Duma, his homeland was a different, and less respected place. He spoke the language of a man who yearned for the lost certainties, who longed for a time when Moscow was to be reckoned with. He did not say it explicitly, but he was clearly stung by Russia's failure to stop Nato driving the forces of its ally, Serbia, out of Kosovo just months previously. "Russia has been a great power for centuries, and remains so. It has always had and still has legitimate zones of interest ... We should not drop our guard in this respect, neither should we allow our opinion to be ignored," he said. His domestic policy was to restore stability, to end what he called the "revolutions", that had brought Russia low. His foreign policy was to regain Russia's place in world affairs. Those two core aims have driven everything he has done since. If only people had been listening, none of his actions would have come as a surprise to them. Oliver Bullough is author of Let Our Fame Be Great, describing his journeys among the peoples of the Caucasus, and The Last Man in Russia, detailing the demographic decline of the Russian nation. He was a Reuters Moscow correspondent between 2002 and 2006 and is now Caucasus editor for the Institute for War and Peace Reporting. Since then, he has seized every opportunity history has offered him, from the attacks of 11 September 2001 to the Ukrainian Revolution of 2013, in his bid to secure his aims. He has been tactically astute and ruthlessly opportunistic. At home and abroad, he wants Russia to regain the prestige it held when he was growing up. The obvious place to start his campaign was in Chechnya, symbol of Russia's collapse. The Chechens had defeated Yeltsin's attempt to crush their self-declared independence, but it proved a bitter victory. The war devastated Chechnya's people, economy and infrastructure. Chechnya became a sink of kidnapping, violence and crime, and - until Putin - no-one did anything about it. Finally, for long-suffering patriotic Russians, here was a man not only able to pay their pensions, but prepared to get his hands dirty to defend their homeland. By the turn of the millennium, when Yeltsin stood down, and appointed Putin acting president in his place, the unknown prime minister's public approval rating was above 70% a level it has barely dipped below ever since. Human rights groups and some Western governments accused Putin of breaking Russian and international law in his pursuit of his Chechen opponents. (The European Court of Human Rights has found against Russia in 232 "right to life" cases, effectively ruling that Russia repeatedly committed murder during its Chechen campaign.) But that has done nothing to dent Putin's popularity. In Chechnya, hundreds of soldiers and thousands of Chechens died. Hundreds of thousands of Chechens fled to claim asylum outside Russia, but Russia's territorial integrity was secured, and Putin had begun his task of restoring Russian prestige. After 11 September 2001, Putin recast his Chechen campaign as part of the global fight against terrorism, thus muting international criticism of his troops' conduct. He became briefly close to President George W Bush - who even claimed to have glimpsed Putin's soul - until the Iraq War drove them apart. In Iraq, Putin insisted that international law must be upheld - no invasion could be allowed without approval from the United Nations Security Council, and that approval was not forthcoming. At home, he crushed the most powerful of the oligarchs, first those who controlled media assets, thus taming the lively television scene, and then in 2003 police arrested Mikhail Khodorkovsky, the richest man in the country. His oil company was dismembered and bought by a state oil company. He was jailed in a process so egregiously predetermined that Amnesty International declared him to be a prisoner of conscience. Putin kept a tight grip on the parliamentary elections at the end of 2003, and his allies gained two-thirds of the Duma. He praised the poll as a step towards "strengthening democracy" - monitors from the Organisation for Security and Cooperation in Europe called it "overwhelmingly distorted". In just four years, Putin had crushed Chechnya, reined in the free media and the oligarchs, gained a parliament that would do whatever he wanted, and shown that Russia had a strong voice in international affairs. "He says what he thinks and does what he says - at least much more than probably any other contemporary politician or statesman. Western analysts and politicians always try to uncover some sort of false bottom in his statements, when there often isn't one. That applies to many other Soviet leaders including Stalin - at least in the run-up to and during WW2," says Dmitry Linnik, London bureau chief of the Voice of Russia radio. "He is a nationalist - in the federal 'Russian', not ethnic 'Russian', sense of the word. That is his biggest driving force, I think - not hunger for power or personal ambition." "I think he has taken a series of decisions, quite rationally from his narrow personal point of view, that this kind of autocratic regime gives him the most personal power and personal wealth," she says. There was one thing missing to make the world of his childhood complete: an ideology. Putin restored some Soviet symbols. He brought back the Soviet national anthem and Soviet emblems, and praised the Soviet triumph in World War Two. But he embraced pre-Soviet themes too. He befriended the Russian Orthodox Church, and name-checked anti-Soviet philosophers like Ivan Ilyin, whose remains he had repatriated to Russia and buried with honour. This trend towards a uniquely Russian form of conservatism accelerated after the wave of protests against electoral fraud that struck Moscow in 2011-2, which alienated Putin from Russia's liberals. Among his favourite ideologues is Vladimir Yakunin, an old friend, a fellow KGB graduate, an Orthodox believer and now head of Russian Railways, one of the country's most strategically significant companies. "Russia is not between Europe and Asia. Europe and Asia are to the left and right of Russia. We are not a bridge between them but a separate civilisational space, where Russia unites the civilisational communities of East and West," Yakunin said in a recent interview with Itar-Tass. Last week, he was added to the US sanctions list for "membership of the Russian leadership's inner circle", following the annexation of Crimea. The idea of Russia being separate from but equal to the West is convenient, since it allows the Kremlin to reject Western criticism of its elections, its court cases, its foreign policy, as biased and irrelevant. Many of Putin's friends, though dismissive of the West's economics, politics, values and structures, are, however, much attached to its comforts. Both of Yakunin's sons live in Western Europe - one in London, one in Switzerland - and his grandchildren are growing up there. According to the anti-corruption campaigner, Alexei Navalny, Yakunin has built himself a palace outside Moscow using foreign limestone and building materials brought in from Germany - a strange step for a man supposedly wedded to creating a Russian economy independent of the West. 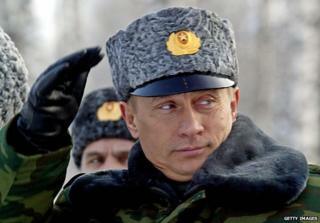 Putin too has espoused principles, then dropped them when they proved inconvenient. In Iraq in 2003, he made a stand in defence of international law, opposing any invasion without UN approval. In Georgia in 2008, he sent in the troops without even pretending to consult with the Security Council. Last year, intervention in Syria was out of the question. This year, intervention in Ukraine is justified and unimpeachably legitimate. It may be that principles have never been the issue - and that Putin's objective has always been to maximise Russian power, and to defy Western attempts to rein Russia in. "We have every reason to assume that the infamous policy of containment, conducted in the 18th, 19th and 20th Centuries, continues today. They are constantly trying to sweep us into a corner because we have an independent position," said Putin in his speech last week announcing the annexation of Crimea, a speech that repeated all his points from 1999, but with 15 years worth of additional resentment. "If you compress the spring all the way to its limit, it will snap back hard. You must always remember this." Many years later, I heard residents of Crimea say that back in 1991 they were handed over like a sack of potatoes. This is hard to disagree with. And what about the Russian state? What about Russia? It humbly accepted the situation. This country was going through such hard times then that realistically it was incapable of protecting its interests. There was not a single armed confrontation in Crimea and no casualties. Why do you think this was so? The answer is simple: because it is very difficult, practically impossible to fight against the will of the people. Our Western partners, led by the United States of America, prefer not to be guided by international law in their practical policies, but by the rule of the gun. They have come to believe in their exclusivity and exceptionalism, that they can decide the destinies of the world, that only they can ever be right. It is not easy re-shaping a country on your own, and Putin has needed the assistance of one key group within Russian society. While he has cracked down on independent journalists, businessmen and politicians, he has relied on state officials to make sure his ideas are implemented. They have been well rewarded for their help. Wages for top officials increased last year by 20%, four times the increase in the general budget. Putin's spending binge means that, for the budget to balance, Brent crude must now average around $117 a barrel, more than five times the level needed in 2006, according to analysis from Deutsche Bank. Even that is not enough for top officials. Interior Minister Vladimir Kolokoltsev, said last week that, in 2013, the average bribe in Russia had doubled to $4,000. Last year, Transparency International gave Russia 127th place on its Corruption Perception Index, rating it as corrupt as Pakistan, Mali and Madagascar. "Putin has really painted himself into a corner by destroying every independent source of power in Russia. He now has only the bureaucracy to rely on, and must keep increasing its funding to keep ensuring its loyalty," says Ben Judah, the British author of Fragile Empire, a study of Putin's Russia. "Eventually, the money is going to run out, and then he will find himself in the same position Soviet leaders were in by the late 1980s, forced to confront political and economic crises, while trying to hold the country together. He looks strong now, but his Kremlin is built on the one thing in Russia doesn't control: the price of oil." Putin has succeeded in building a version of the country of his childhood, one that can act independently in the world, and one where dissent is controlled and the Kremlin's power unchallenged. But that is a double-edged sword, because the Soviet Union collapsed for a reason, and a Russia recreated in its image risks sharing its fate. According to Vladimir Bukovsky, a dissident who spent a decade in Soviet prisons before his exile to the West in 1976, Putin is totally genuine when he says the disintegration of the Soviet Union was a "geopolitical catastrophe". "He does not understand that the collapse of the Soviet system was predetermined, therefore he believes his mission is to restore the Soviet system as soon as possible," he says. As a middle-ranking KGB officer who loved the Soviet Union, Putin lacked the perspective of senior officers, who knew full well the Soviet Union collapsed under the weight of its own inefficiency rather than because of Western plotting, Bukovsky says. "It leads him exactly to… repeat the same mistakes. He wants this whole country to be controlled by one person from the Kremlin, which will lead to disaster," he says. Putin's decision to invade Crimea was taken quickly and impulsively, by a small group of his favoured top officials. That means Putin has no one to warn him of the long-term consequences of his actions, and until he finds out for himself, he will maintain his course. That means relations with the West will remain uncomfortable, especially in areas he considers to be his "zone of legitimate interests". Oliver Bullough is Caucasus editor at the Institute of War and Peace Reporting. His most recent book is The Last Man in Russia, detailing the demographic decline of the Russian nation.